Since January 27, 2017, we have been fighting the Muslim ban in the courts and on the streets. As an Iranian-American lawyer, with family, friends, and clients coming through San Francisco International Airport during Muslim Ban 1.0, I remember how thousands of community members and our allies came out to the airport in protest. That resistance and solidarity kept a national spotlight on the Muslim ban and kept us going in securing the release of individuals wrongfully detained at the airports. Fast forward to March 30, 2018. 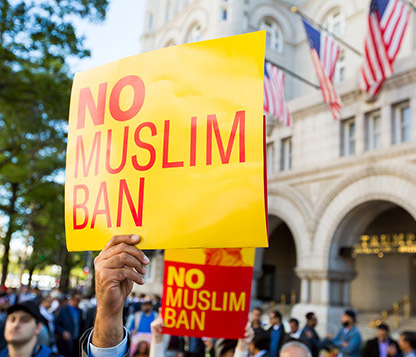 Hundreds of civil rights organizations representing individuals impacted by this third iteration of the Muslim ban, members of the Japanese-American community, immigration and constitutional law experts, LGBTQIA leaders, business and labor organizations, states, elected officials, and national security experts filed amicus (friend-of-the-court) briefs in opposition to the Muslim ban. Amicus briefs will provide perspectives and expertise to the Supreme Court on legal issues as it prepares to hear oral arguments on the case on April 25, 2018. I am personally moved by the amicus brief of Karen Korematsu, Jay Hirabayashi, and Holly Yasui — the children of Fred Korematsu, Gordon Hirabayashi, and Minoru Yasui. They see the disturbing relevance of the Supreme Court’s decisions in their fathers’ infamous cases challenging the mass removal and incarceration of Japanese Americans during World War II. Their amicus brief outlines the parallels between the two cases as the U.S. government is once again asking the Court to blindly justify blanket action against an entire group. It is also critical that the amicus briefs capture the impact Muslim Ban 3.0 has had on our communities. Since December 4, 2017, when the Supreme Court allowed Muslim Ban 3.0 to go into full effect while lower courts heard challenges to the case, we have been inundated with cases involving mass visa denials for children, spouses, parents, and grandparents, including Iranian, Yemeni, Somali, Syrian, Libyan U.S. citizens and green card–holders, students, and people with urgent medical issues. While the text of Muslim Ban 3.0 claims to have a “waiver process,” by which if a waiver is granted the ban will no longer prevent the applicant from obtaining a visa, the reality on the ground is chaos, because there is no process, and waivers are not being granted. The amicus briefs of the Pars Equality Center and immigration law scholars capture the devastation and hardship I have been witnessing and fighting against for the last year as well as the legal limbo and whiplash of a year of litigation over three versions of the Muslim ban. All versions have been found to violate federal law by lower courts. The Muslim ban is only one of many attacks on immigrant communities we are fighting. Hundreds of immigrants’ rights organizations, practitioners, and professors — including the Immigration Law Clinic at my alma mater, the University of California, Davis — that are fighting the rescission of the Deferred Action for Childhood Arrivals, or DACA, program as well as the detention and deportation of immigrant community members, submitted amicus briefs outlining how the Muslim ban clearly violates the Immigration and Nationality Act. These amicus briefs highlight key points for the Supreme Court to consider as it hears the case. And I hope they will push the Court to rule in our favor. Join us in rallying on Wednesday, April 25, to say #NoMuslimBanEver. Elica Vafaie is a staff attorney at Advancing Justice – Asian Law Caucus and program manager of its National Security and Civil Rights Program. This entry was posted in Uncategorized on April 17, 2018 by Richard Irwin.